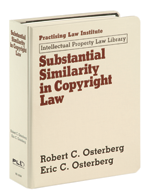 The first treatise to fully discuss this pivotal subject, Substantial Similarity in Copyright Law remains the clearest and most comprehensive reference on the topic. Substantial Similarity in Copyright Law gives you in-depth insight into the types of similarities that trigger findings of infringement and those that do not. You’ll learn how substantial similarity tests apply to specific kinds of copyrightable subject matter—from fiction to computer programs, and from sound recordings to architectural works­—analysis you cannot find anywhere else. This book identifies and explains circuit by circuit the substantial similarity tests used in each U.S. Circuit Court of Appeals. You’ll learn how substantial similarity is addressed at different stages in litigation in each circuit, on a motion to dismiss, at summary judgment, and at trial. You also will learn how and when expert witnesses can be used in copyright infringement cases, and when they cannot. Packed with illustrations from litigated cases, this comprehensive reference enables you to see how this vital concept is applied in your jurisdiction to the type of copyrightable work involved in your case, enhancing your ability to analyze, predict and litigate copyright disputes. Robert C. Osterberg is one of the top copyright litigators in the nation. He has been lead counsel in some of the best-known copyright infringement cases, including Selle v. Gibb, Gilliam v. American Broadcasting Cos., MCA, Inc. v. Wilson, Gaste v. Kaiserman, and Woods v. Bourne Co. He has been counseling clients with respect to copyright matters for almost forty years and is the former senior partner of Abeles Clark & Osterberg in New York City. Robert was a panelist for PLI’s Advanced Seminar on Copyright Law from 1992 through 2001 and an adjunct professor of copyright law at Roger Williams School of Law. His publications include “The Use of Derivative Works After Copyright Termination—Does Woods v. Bourne Expose a Quagmire?”, 43 J. COPYRIGHT SOC’Y 28 (1995). Robert received his B.A. from Brandeis University and an LL.B. and LL.M from New York University School of Law. Eric C. Osterberg is the founding member of Osterberg LLC in Stamford, Connecticut. He tries copyright, intellectual property, and general commercial litigation cases in the federal courts and counsels clients on copyright, trademark, trade secret, and false advertising issues. He writes and speaks regularly on copyright issues. Eric’s speaking engagements include appearances before the New York chapter of the Copyright Society of the U.S.A., the Copyright Society of the South, and members of the New York State Bar Association. He serves on the Editorial Board of the AIPLA Quarterly Journal and served on the committee that wrote the model jury instructions for copyright infringement cases in the ABA’s Model Jury Instructions: Copyright, Trademark and Trade Dress Litigation. Eric’s publications include “Should Sound Recordings Really Be Treated Differently Than Other Copyrighted Works? The Illogic of Bridgeport v. Dimension Films,” 53 J. COPYRIGHT SOC’Y 619 (2006) and “What Napster Means for Copyright Infringement,” originally published in the ABA’s Intellectual Property Law Newsletter (Spring 2001) and reprinted under the heading “The Best Articles Published by the ABA” in the ABA’s GP Solo (March 2002). Eric received his B.A. from Northwestern University and his J.D. from Emory University School of Law. He can be reached by email at eosterberg@osterbergllc.com and found on Twitter @OsterbergEric. His blog is Osterberg’s Blog, http://osterbergblog.typepad.com/blog.